For nearly 100 years, ozone has been used all over the world for water sanitation. It is nature's strongest oxidizer and has a byproduct of pure oxygen. Chlorine, on the other hand, is a very effective, time-proven chemical, but is ineffective against hard-to-kill microorganisms such as cryptosporidium; it also has some unpleasant byproducts. Ozone is recognized among the strongest, fastest, commercially available disinfectants and oxidants for water treatment, Ozone is used in both the disinfection of drinking water and bacterial killer in waste water treatment. Ozone is used in a large percentage of Municipal water treatment facilities as well as Pharmaceutical companies where pure water is essential. A large Municipality having both a water purification system and a waste treatment facility, decided to upgraded to an Ozone generation system to remove bacterial pathogens from both water streams. Customer needed a price competitive means of monitoring both locally and through a control system to insure the proper flow of Ozone was being injected to meet EPA standards. 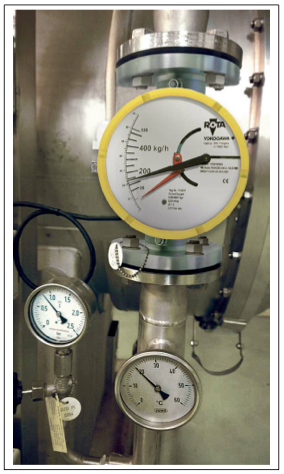 Because of their price competiveness, large bold display and the optional 4-20 ma transmitter option with limit switches, Yokogawa's RAMC Rotameter were chosen to be the solution to this customer's needs. When a problem occurs that reduces the Ozone flow below the needed amount the RAMC limit switch would activate an alarm. Crews would then go and correct the situation and use the local indication to verify their corrective actions worked. To assist you in locating these water treatment opportunities in your area, below are links that list all the water treatment plants in the United States.